Take Mexico Federal Highway (1) south (approx. 925 miles). 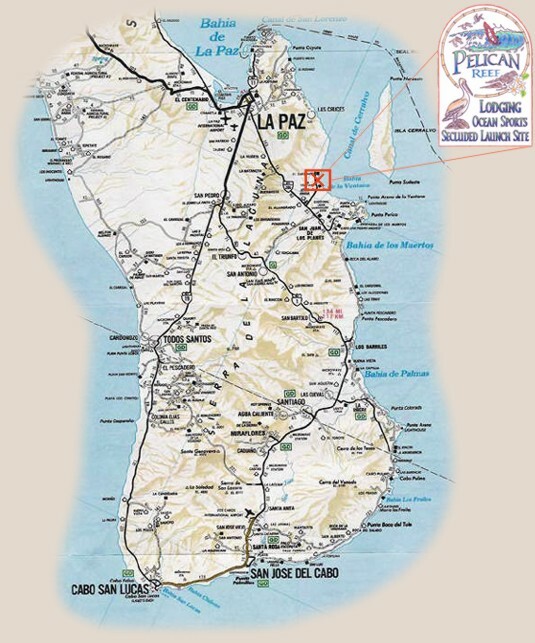 Pass the La Paz Airport turnoff. Turn right on Libramiento Sur. (travel for about 1.75 miles). Turn Left on Blvd Forjadores for approx. 1.3 miles. Sorianas Shopping Center is on the left for your last minute needs. Turn Right on Calafia (286) for 23 miles. Look for sign to El Sorjento. Turn left at the resort signs for windsurfing. Go 6 miles to Pelican Reef Resort (on right just past campground). We suggest shopping at a large grocery store in La Paz before you arrive at Pelican Reef Resort. Note, there is an outstanding, fully equipped kitchen for cooking your favorite dishes. Restaurants also are nearby as well as small local stores. 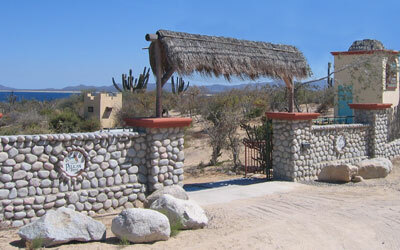 Aero Mexico has daily flights to La Paz or San Jose Del Cabo. You can book your flights and car rentals at www.Travelocity.com. For more travel information go to www.MexOnline.com. For travel identification, you will need a passport or a certified copy of your birth certificate.